We met by chance when you were promoting Animation Comics And Entertainment at the 2018 Inbeon Con in Long Island. Though Inbeon was a single day event, how much of a success was it in terms of meeting new contacts and fans? Every time we go to a convention we meet new fans and artists who have been doing these conventions a lot longer than us. Each person is always willing to give us a helping hand or tell us some information on another convention. When it comes to meeting fans I think it’s because we have more than one book available, Salvation and Nightfall: Michael's Awakening. 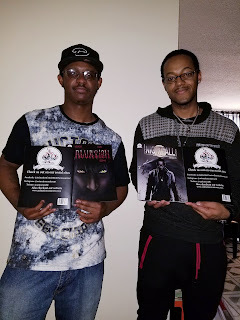 Both are different from each other; Salvation is about demons within a fantasy setting and Nightfall: Michael's Awakening is about werewolves with a more modern setting. I think it definitely helps us stand out. We have three others coming up, and we have the posters for them. People are excited about them; it makes us happy that they are interested in our stories. We really can't wait for the future of A.C.E. What artists and publishers did you meet at Inbeon willing to help you out one way or another? When I was Inbeon I didn't really meet many people. Most of the artists were people I've seen, I was by myself so I decided to just stay at my booth. I did meet the owner of Inbeon Studios, Eric Hutchison. He seemed like a respectable person and said he saw me as a kindred spirit, which was a huge compliment. Where is Animation Comics And Entertainment based, and how long has it been active? Who did you found it with and what inspired you? Have your promotional appearances mostly been at local conventions, or have you had to travel occasionally? Animation Comics & Entertainment LLC is based in Brooklyn, New York and started with me, Dwayne Robinson Jr., and my childhood friend from high school Terence Young. We always were talking about how we had ideas on making comics. More so with Terence. I was thinking of maybe starting a rock band or being involved in entertainment some way. But then we decided doing comics was a great way to show our creativity, and having our own would be fun so we wouldn't have any restrictions. Thus A.C.E. was born. It's hard to believe it’s been two years since we started promoting. It has been going strong for a year now, staying locally in New York just to build a fan base. Eventually we will be traveling to other states, but when you live in New York it's a great place to start. But as I said expansion is also necessary. How long did you have aspirations for a musical career before becoming a full time comic artist? What led you to change your mind? I would say I never stopped. My goal is to one day put out music for my company. It may seem like a bold or crazy thing to shoot for but I put no limitations on it. The music would be the entertainment part of it. So maybe one day people will see that side, but probably no time soon. Name some of the conventions in Brooklyn and Long Island where you have made appearances to promote your work. Have you appeared in other areas such as Queens, Staten Island or Manhattan? To where would you most like to expand? Having started this year we appeared at Cradle Con and Inbeon Con in Long Island. We wanted to go to Borough Con in Brooklyn but they never called us back. We have one show in Pennsylvania and a few other states, but the main place we are looking to is Comic Con. We are trying not to go to too many shows. We want to take some time to finish the three upcoming comics we have. But next year we will be going to any in the Tri-State area and maybe further. We'll see how long it takes. Are you and Terence formally educated or self-taught at writing and drawing? If you have had any formal education, where did you go? Me and Terence are both self-taught. I always enjoyed writing, whether its songs, stories or poetry it's fun to have that type of expression. I found it therapeutic. I still try to write poems and songs when I get a little free time. Are there any poems or songs you have had a chance to write recently? No, unfortunately. I want to but I'm perfectly fine with not being able to write poems or music. I'm enjoying writing stories and seeing people really looking forward to them. It really makes me excited to hear people's thoughts whether good or bad. Describe the storylines of Salvation and Nightfall: Michael's Awakening, along with the lead characters of both tales. Salvation is about the main character Vahn, a half-human half-demon born with a mysterious curse mark on his hand given to him by his grandfather and who is searching for a legendary sorcerer called Solomon. Vahn feels that having this curse mark has brought him nothing but pain and anguish. Along the way he finds out more about his mark and what he can do. Nightfall: Michael's Awakening is about the main character Michael Vash, a normal college quarterback who finds out from his mother (who is known as the town crazy person) that he is part of a long line of legendary werewolves. Now it's up to Michael to believe that what his mother is saying is true or if she is really just crazy. This has him torn because he loves his mother either way. It leads him to a whole new journey. Salvation and Nightfall: Michael's Awakening seem based on different themes, the former being more mystical/supernatural and the latter being more rooted in real life. Did you set out to make this distinction or did it gestate and develop naturally? We made the stories different from one another. The only connection they have is that both of the main characters are people of color. We felt having the ability to create two different types of stories would expand our fan base. Every story we have so far is from its own universe, so to speak. Every now and again we throw a small Easter egg in some of them, just to show they’re all under the A.C.E. banner. We are writing a shared superhero universe, but we're still waiting til we have a bigger fan base. We also want to possibly do the superhero universe as animation instead of comics. Were the storylines of Salvation and Nightfall: Michael's Awakening collective efforts of you and Terence Young? Did you draw on demon and werewolf folklore while devising the storylines, or are these tales purely fantasy-based? For the stories I did wrote the story for Nightfall: Michael's Awakening. It started off by a desire to do a unique werewolf story. I drew inspiration from movies like An American Werewolf In London, Underworld and Wolf to name a few. I actually always have been a fan of werewolf stories. Salvation was written by Terence. I would say he is knowledgeable about demonology and draws influence from old school anime and other supernatural stories. What do you think of the impact An American Werewolf In London had on cinema when it came out? How do the sequels of that movie measure up to it? I believe it made a huge impact on how much you can show and use with makeup and how stories with werewolves is a genre that can make money. It’s a genre that many people enjoy. Besides the movies you mentioned, do you appreciate any classic werewolf comics and novels? No other movies really come to mind but I enjoy finding new comics and movies just to see if they’re different from what I've already seen. I don't seeing the same type of stories with different characters. I believe that there's still room for many more unique stories. What comics and movies about werewolves have you recently come across? Did you find any differences in them from comics and movies you’re used to? There's actually nothing that I've seen recently to really inspire me but I think that's why I made Nightfall because there all the same thing nothing different from the rest. Movies are really bad; I feel they lack creativity nowadays to me. I think comics, graphic novels and anime is really where creativity still exists. Which is why you see so many movie adaptations of them. How much knowledge about demonology does Terence have, and how does he write it into the Salvation storyline? I would say Terence’s knowledge of demonology is vast, but the characters aren't really created from known demons. It's a good mixture of those you know and characters from his own mind. How many editions of Nightfall and Salvation have been released to date? How many more do you have planned? For Salvation there are about twenty four issues, which goes into another story arc with the main character so to say the least Salvation is definitely a long series. Nightfall: Michael's Awakening is also pretty long but as much with having ten issues with another ten as a prequel explaining Michael's family. Depending on how much interest that prequels gets maybe we might the series but we'll see what happens. There's so many other stories we have in mind so we don't want to continue doing the same series over and over. Have Salvation and Nightfall gotten favorable reviews in print and/or online? I would say that both Salvation and Nightfall started out with making more sales with prints and now we are slowly picking up speed with online sales thanks to Amazon affiliated sites like Comixology, Createspace and Kindle. How long do you expect the storylines of Salvation and Nightfall will turn out to be? Do you add new elements and plot devices into these storylines as you go along? Salvation is longer than Nightfall: Michael's Awakening but we're not changing the plot. We feel people will enjoy were the story goes. If not I'm sure there's another story people might enjoy other than the two we have now. Describe the supporting characters in both your series and how they interact with the main characters. That’s hard to do without giving away what happens in the next few issues we have coming up. I don't want to ruin either story by giving that away. Best thing I can say is in Nightfall Michael has a girlfriend, Melissa, who is new to the town. Michael was attracted to her from the first time he saw her. Their relationship is special because she doesn't really know too much about Michael's past and what he had to go through as a child living with his mother. Then there's Victoria or, as Michael calls her, Tori. This is Michael's childhood friend and they are close like a brother and sister would be. They always taking care of one another and have each other’s backs. The Salvation characters come in the next issue whereas in Nightfall they appear as you go deeper into the story. Following us on our social sites is a great way keep up with them. Who designs the cover artwork and the interior artwork for both your series? I was the one who designed the covers with Terence adding input for Salvation's interior and cast of characters. We like to do most of the company’s things as a team. I feel having someone who is as creative as you is great because you can bounce ideas with one another making the stories better. Together were you able to draw and design the lead and supporting characters as you envisioned them? When it comes to the characters I feel we did a great job on what we were shooting for. Where do you take each issue of Salvation and Nightfall to be printed? Are the rates generally affordable? We look around to many places but found a very affordable printing in Queens called Endeavors Printing LLC. They even gave us a black border. Which I believe made the artwork pop even more. If it were at all possible, would you like to see either of your series in publication made into films or miniseries like those shown on the Sci Fi Channel? Having any of our stories as a live action movie or TV show would be fantastic for us. The problem with that is, most of time they don't really follow the story all that well but again it's something that would still be interesting to see. I welcome the idea for sure. What can you reveal to the readers about the new comic series you are planning to release? Outside of the five we have, we're not going to release any more information about the stories we have planned. But that if you check back in a year those things might be revealed. Regarding the posters made for your new projects, were those conceptualized and designed by the same parties? Have they been released as teasers of sorts for the new series or are you waiting to release them? The new posters are comics that will be released before the year is over. I, Dwayne Robinson Jr., designed the posters. How well known would you want Animation Comics And Entertainment to be in the years to come? In a few years I would like the company well known. Maybe enough to the point where people will buy our comics with anticipation knowing that the stories will be good whether in comics, animation and more. Thanks for putting time out to ask the questions we appreciate this a lot.